A growing collection of free walks suitable for all ages, from an hour-long potter to half-day hikes. We have walking tips for those new to rambling and a comment box beneath every walk for your feedback - you may need to disable any ad blocker to add comments. This walk is lovely (a combination of two of our shorter walks), but you do have to watch out for cars. And you might get muddy because there are two paths along the way that get churned up after rain. There are four pubs either along the way or accessed by short detours. Park in the car park at The Woodman, Wildhill and take the path to the south-east of the beer garden. Head uphill diagonally south-west to a gate in the hedge. Go through the gate, across the next field, through another gate and, keeping the woodland on your left and the field on your right walk east following the path through the crops until you reach a broken stile leading to Kentish Lane, the B158. Turn left on Kentish Lane and, walking along the east side of the road, head north, until you reach Wildhill Road on your left. Cross carefully here (best before the bend), and continue heading north-east along Kentish Lane until you reach Hornbeam Lane on your right. Follow Hornbeam Lane south-east until it becomes a path. Continue along the path, down a dip, up a hill, through a Hornbeam wood and then emerge on Cucumber Lane. Turn left on Cucumber Lane and follow it north-west until you reach Berkhamsted Lane. Turn right and follow Berkhamsted Lane for almost a mile until you reach a track on your left just before the outskirts of Little Berkhamsted. (At this point you could continue into Little Berkhamsted where there is a corner shop and The Five Horseshoes. Take this track until you reach a farm where it becomes a footpath. Walk along this path, through the gorse, down through the woods and to the bottom of the hill where you reach the golf course. Follow the way marked signs pointing west up to the club house where you turn right then left, across the course and emerge in Essendon. Walk up to the B158, Kentish Lane and turn left. (At this point you could continue along Kentish Lane to The Rose & Crown if you want refreshments). You will see a footpath sign pointing west on the southern edge of the cricket club. Take this path and follow it as it edges the cricket pitch, drops down through woodland, crosses a wooden bridge and then continues uphill with fields on your left and the hedgerow on your right until you reach path 14, a BOAT (Byway Open To All Traffic). (At this point, if you are hungry/thirsty and it's opening time, you could head straight across the BOAT and up a footpath to The Candelstick). Here you turn left and follow this track up and down hill as it twists and turns until it reaches West End Lane. Turn left on West End Lane and follow it back to Wildhill and The Woodman car park. You can find out who is behind this site along with some tips for preparing for the walks by visiting our about page. Information about the content that appears on the site is set out on our copyright page. If you want to be notified when new walks are added, just add your email address below, click 'submit', then respond to the confirmation email. 89: Welwyn North NE Loop - 7mi. 88: Ermine Street East Loop - 7 mi. 87: North Mymms to Welwyn Garden City Linear - 13 mi. 86: Hadley Wood to Brookmans Park Linear - 7 mi. 85: North Mymms Park S Loop - 7.4 mi. 84: Waterford Heath Loop - 2 mi. 83: North Mymms S Long Loop - 4.2 mi. 82: Kimpton N Short Loop - 5 mi. 81: Wormley Wood Loop - 2.5 mi. 80: Panshanger Park Long Loop - 4.75 mi. 79: Panshanger Park Short Loop - 3 mi. 78: Welwyn NE Loop - 7.7 mi. 77: Old Knebworth SW Loop - 6.2 mi. 76: Old Knebworth N Loop - 3 mi. 75: Hitchwood Loop - 3.5 mi. 74: North Mymms NE Loop - 3.5 mi. 73: Hatfield Linear NW - 7.5 mi. 72: Essendon Linear NW - 8 mi. 71: Brookmans Park Linear NE - 3.7 mi. 70: Brookmans Park Linear NW - 4 mi. 69: Brookmans Park Linear SE - 3.5 mi. 68: Brookmans Park Linear SW - 3.2 mi. 67: Kentish Lane Loop - 10 mi. 66: Danemead Loop - 3.3 mi. 65: Mimmshall Brook Loop - 8.5 mi. 64: Gustard Woods Loop - 1.5 mi. 63: Gobions Wood Loop - 2 mi. 62: Ayot Loop - 7.5 mi. 61: Danesbury Park Loop - 2.5 mi. 60: The Sculpture Walk Loop - 1 mi. 59: Burn's Green Loop - 4.2 mi. 58: Wadesmill Loop - 6 mi. 57: Chapmore End Loop - 5.2 mi. 56: Great Wood, Northaw Loop - 2.75 mi. 55: Ayot NE Loop - 2.8 mi. 54: Symondshyde Loop - 4 mi. 53: Essendon Long Loop - 6.5 mi. 52: Wildhill SE Loop - 4.5 mi. 51: Mymmshall Wood Loop - 3 mi. 50: Bayford Linear - 8.3 mi. 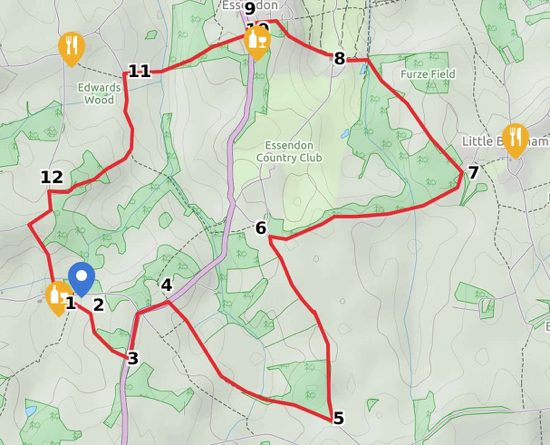 49: Ayot Short Loop - 1.5 mi. 48: Kimpton Loop - 5.3 mi. 47: Mimram Valley Loop - 3.3 mi. 46: Tewin N Loop - 4.7 mi. 45: Tewin W-E Loop - 4.2 mi. 44: Bramfield Loop - 3.7 mi. 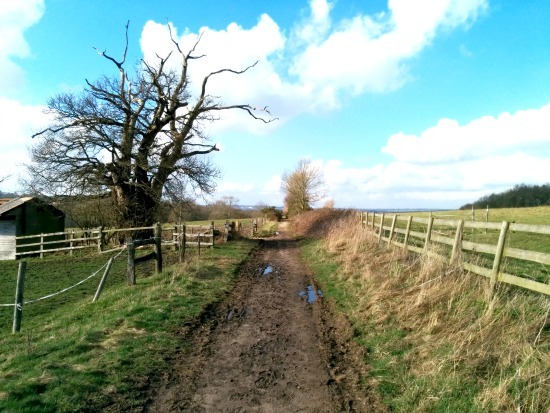 43: Datchworth Loop - 5.2 mi. 42: North Mymms Linear W - 7.4 mi. 41: Northaw Loop - 13.2 mi. 40: Ayot Greenway N Loop - 5.6 mi. 39: Ayot Greenway W Loop - 5 mi. 38: Ayot Greenway S Loop - 3.7 mi. 37: Three Ridges Loop - 8.3 mi. 36: Lea Valley Loop - 4.3 mi. 35: Letty Green Loop - 3 mi. 34: Essendon S Loop - 6 mi. 33: West End Double Loop - 5 mi. 32: Brookmans Park SW Loop - 7.8 mi. 31: North Mymms SW Loop - 6 mi. 30: Colney Heath S Loop - 4 mi. 29: Wildhill SW Loop - 7 mi. 28: Brickendon Loop - 6.3 mi. 27: Broxbourne Wood N Loop - 6.5 mi. 26: Broxbourne Wood S Loop - 5.5 mi. 25: Little Berkhamsted Loop - 4.3 mi. 24: Brookmans Park - Wildhill Loop - 6.5 mi. 23: Hatfield Linear NE - 9 mi. 22: North Mymms Way Loop - 12 mi. 21: Cucumber Lane Loop - 6 mi. 20: Essendon Loop - 3.6 mi. 19: Brookmans Park NE Loop - 7.5 mi. 18: Tylers Causeway Loop - 4.7 mi. 17: Hornbeam Lane Loop - 4 mi. 16: North Mymms Ridge Loop - 6 mi. 15: Wildhill Double Loop - 4 mi. 14: Woodman Loop - 4.8 mi. 13: Candlestick Loop - 4.1 mi. 12: Old Welwyn Loop - 4.5 mi. 11: West End Loop - 4.5 mi. 10: Brookmans Park Long Loop - 5 mi. 9: Howe Green Loop - 3.5 mi. 8: Newgate Street Loop - 3 mi. 7: Little Berkhamsted Loop - 3 mi. 6: Wildhill Loop - 3 mi. 5: River Lea Loop - 3 mi. 4: Epping Green Loop - 3 mi. 3: Water End Loop - 3 mi. 2: Camfield Place Loop - 3 mi. 1: North Mymms Loop - 3 mi. All content on this site is released under Creative Commons BY-NC-SA 4.0. Picture Window theme. Powered by Blogger.